He put in his thumb and pulled out a plumb and said: what a good boy am I! I am happy to say I can provide good-son plum pie, all on account of massive quantities of plums and a penchant for pie. And especially because: I canned plum pie filling. In Liana Krissoff's Canning for a New Generation, I ran across a recipe for plum pie filling (FYI I adjusted it slightly, but safely). Normally I am not a big fan of cups and cups of sugar finding their way into my fruit jams and jellies, but I wasn't going to let a chance to learn how to make/preserve pie filling pass me by. Having a Master Certificate in Preservation means I am on the hunt to push my repertoire and knowledge on every which way you can: freeze, dry, can, pickle and otherwise preserve seasonal bounty well beyond 'ripe.' Even if once in awhile it means excess sugar. My sister-in-law makes killer pie, so I quickly texted her to ask about her pie filling. She frequently uses summer's fruit to make ready-to-go pie filling, then tucks it into her freezer. She simply tosses slices of apples with some sugar and cinnamon plus a little lemon juice. The key being: when you take the ready-pie-fruit from the freezer (or jar), you simply need to add the thickener (e.g. flour or cornstarch), hit the oven on button and fill the pie crust. I knew my dedication to adding 'pie filling' to my pantry would translate into many more pies throughout the year. Instead of using up valuable freezer space (pig, salmon, blanched favas, hoards of blackberries, farm-raised chicken and vodka currently reside there), I aimed to put plum pie-filling in jars. It takes more sugar than if I were to just toss the filling together and freeze it. I justified it: I would use just the plums for the pie filling---maybe mixed with some blackberries or peaches or apples---and save the 'plum syrup' for insanely yummy Italian sodas. Cut out pits, put plums, lemon juice, 2 cups sugar and spices in bowl to macerate for an hour. Drain juices into pan and bring to simmer. Put plums back in bowl, add another cup sugar and let sit. 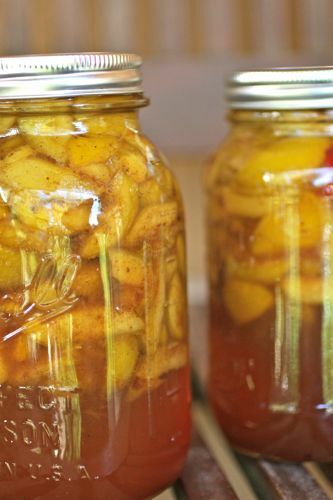 Prepare jars/rings/lids and water for canning. 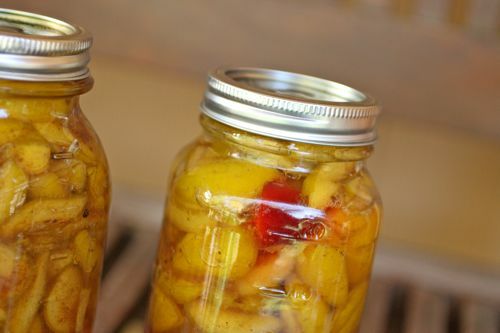 Pack plums into hot jars, leaving 1 1/2 inches headspace. Cover with plum syrup, leaving 1/2 inch headspace. Use wooden chopstick to remove excess bubbles, wipe rims, tighten lids and process for 25 minutes. Note: I put all the pits in a jar with rum. Plum and rum enjoy each others company; tuck the jar into the back of a dark, cool cupboard. In a few months you will have a fortified plummy rummy liquor. Mmmmmm. Dear family: this year you will enjoy many plum-filled pies... now you are thinking: what a good girl am I?